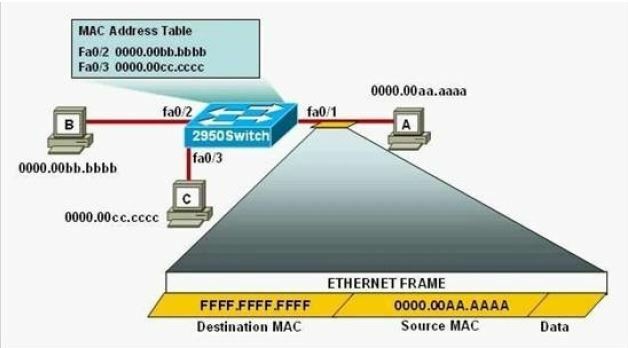 The following commands are executed on interface fa0/1 of 2950Switch. E. Hosts B and C may forward frames out fa0/1 but frames arriving from other switches will not be forwarded out fa0/1. F. Only frames from source 0000.00bb.bbbb, the first learned MAC address of 2950Switch, will be forwarded out fa0/1. The configuration shown here is an example of port security, specifically port security using sticky addresses. You can use port security with dynamically learned and static MAC addresses to restrict a port’s ingress traffic by limiting the MAC addresses that are allowed to send traffic into the port. When you assign secure MAC addresses to a secure port, the port does not forward ingress traffic that has source addresses outside the group of defined addresses. If you limit the number of secure MAC addresses to one and assign a single secure MAC address, the device attached to that port has the full bandwidth of the port. Port security with sticky MAC addresses provides many of the same benefits as port security with static MAC addresses, but sticky MAC addresses can be learned dynamically. Port security with sticky MAC addresses retains dynamically learned MAC addresses during a link-down condition.